Including a species' biology in sample guideline calculations for saving seeds, such as the ones that produce some rare trillium species seen here, can dramatically improve sampling effectiveness, says a new study. KNOXVILLE—Restoring diverse vegetation along the Atlantic seaboard after devastating hurricanes or replanting forests after destructive wildfires rests mightily upon one tiny but important ingredient: the seed. Seeds are also important for conserving rare species, from trees to shrubs to other flowering plants. 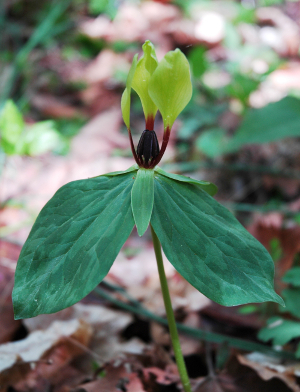 For example, the recently discovered Trillium tennesseense is only known in three locations in East Tennessee. But seeds must be saved the right way. Including a species' biology in sample guideline calculations can dramatically improve sampling effectiveness, according to a new study from the National Institute for Mathematical and Biological Synthesis. For a long time, seed sampling guidelines have typically been quite general: the same recommended minimum sample applied to all species, roughly 50 seeds per population, whether a towering tree, widespread grass, or a small bee-pollinated herb. Such recommendations were based on genetic theory without considering plant ecology and reproductive biology. In the new study, published today in the journal Biological Conservation, researchers tested the importance of three factors in seed sampling: a species' "selfing" rate, or rate at which a species pollinates itself, its seed and pollen dispersal distances, and whether an annual or perennial. The first key finding is that sample size should be different for species' with different reproductive biology in order to capture enough genetic diversity, which is critical for biodiversity. Specifically, species that are highly selfing and have low seed dispersal distances appear to need sample sizes five times as large, the study found. And species that are perennial may also need larger sample sizes. Thus, a single guideline applied to all species as has been typically used in the past may lead to sub-optimal seed collections, the study's authors concluded. The study's other key finding is that spatial factors are also important. Sometimes a collector cannot reach all parts of a population due to political, logistic, jurisdictional, time or equipment limits, or otherwise cannot sample in ideal random fashion due to challenging landscapes. In reality, random sampling as recommended is just not possible, and so many collections are from small, easy-to-access location. The study determined that in cases of small spatial coverage, the seed sample should be two to ten times larger than a random sample. The researchers used a highly detailed mathematical model to simulate a plant population over time. They also tested sampling on datasets for three species—a tree, an herb and a shrub. "Simulation models such as the ones we built can help tailor sampling strategy to specific plants, even when genetic data is not available," said lead author and NIMBioS postdoctoral fellow Sean Hoban. Hoban is developing computer software that would help conservationists run robust estimations of sampling strategies prior to conducting seed collection. "This could be very helpful to seed collectors wanting to make decisions about different sampling practices," Hoban said. In their next work, Hoban and colleagues plan to incorporate population history, geographic distributions, and environmental selection pressures to the models in order to help conservation managers develop guidelines for particular species. Later, they will use economic models to identify protocols that best balance the genetic gain of seed collections versus financial constraints.